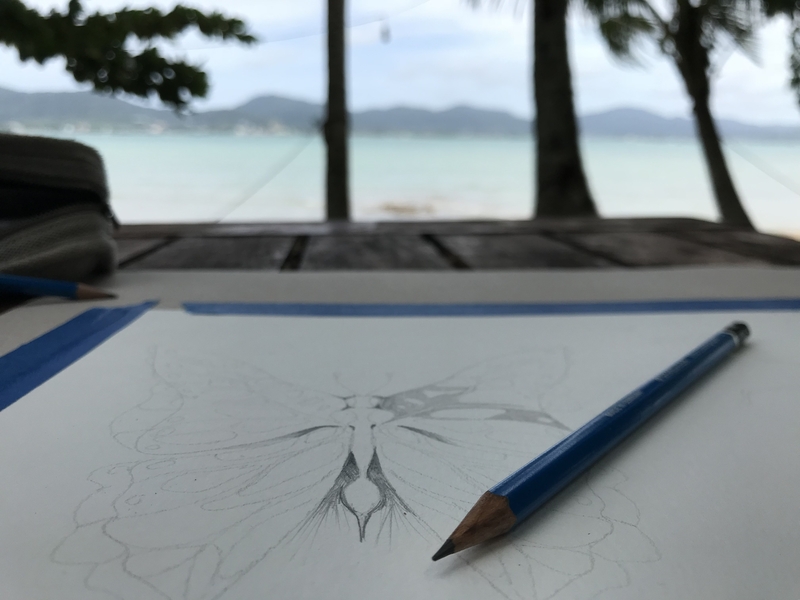 I spent time walking around the island looking for forms to draw. 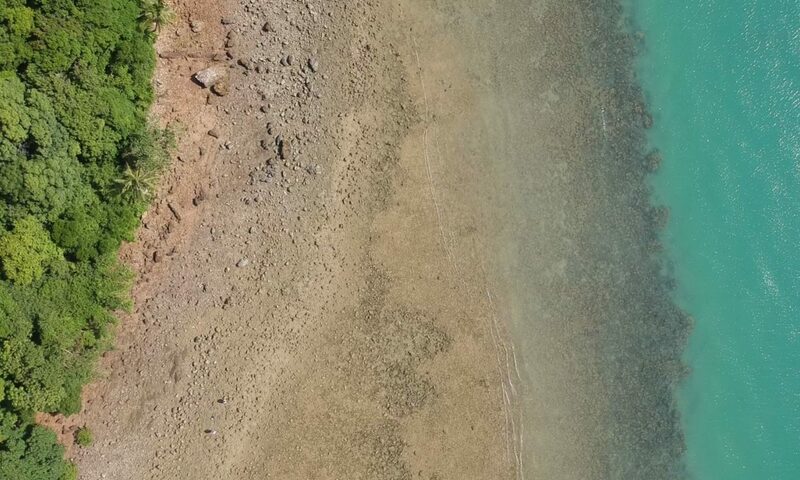 I particularly focused on trying to find organisms or objects that would be compatible with some form of procedural creation. 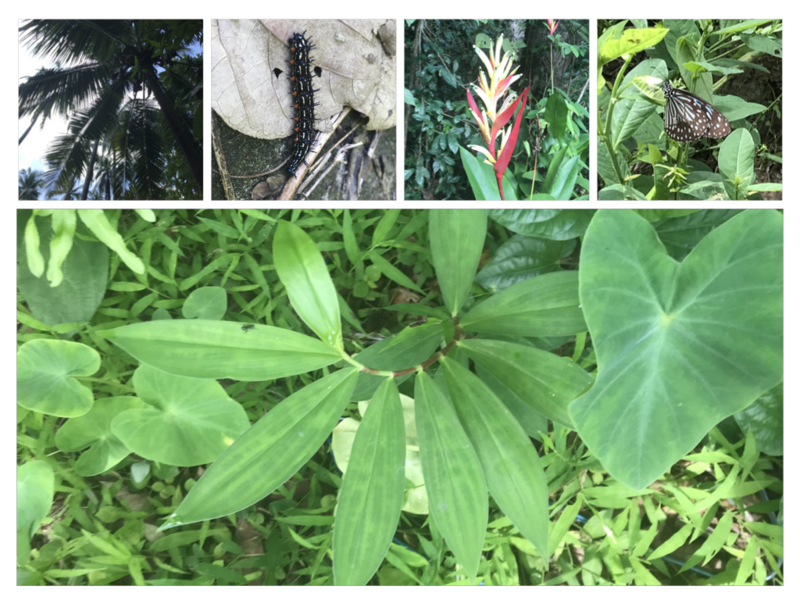 Complexity, fractal patterns, or symmetry are all possible to represent relatively easy with code, so I looked for organisms with similar properties. After settling on an organism to draw for the day, I then used Processing to write a simple program that produced forms that represented some aspect of that organism. Because coding is a somewhat anti-social activity, I tried to keep these coding sessions short- no more than a couple hours at most. 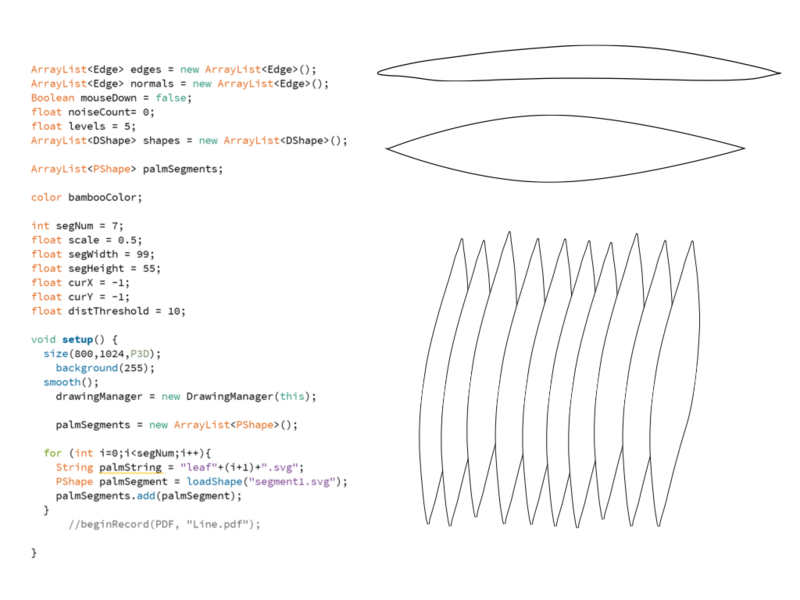 The programs I wrote in Processing were designed to function essentially as drawing tools in that they were designed to generate some form of procedural pattern based on mouse input. 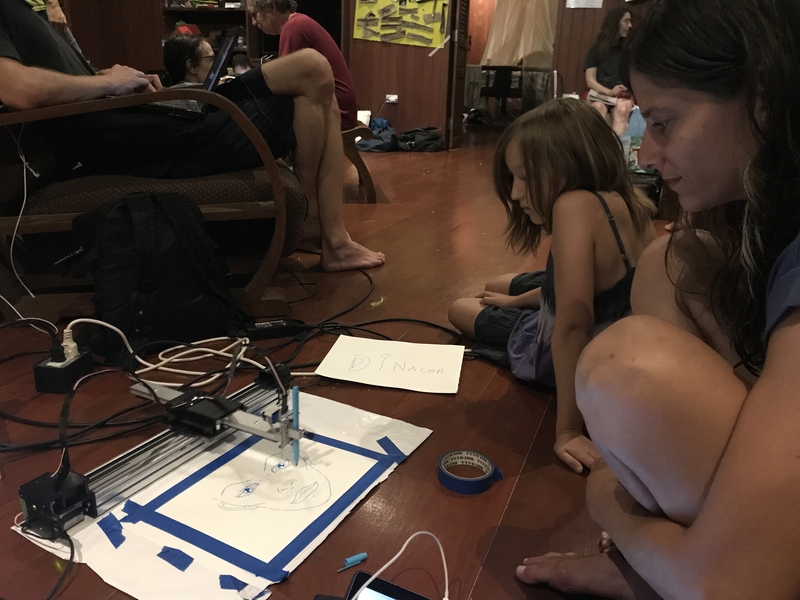 By hooking up a tablet and stylus to my computer, I could use the stylus to create different procedural drawings that transformed my manual line. I exported these drawings as vector PDFs. 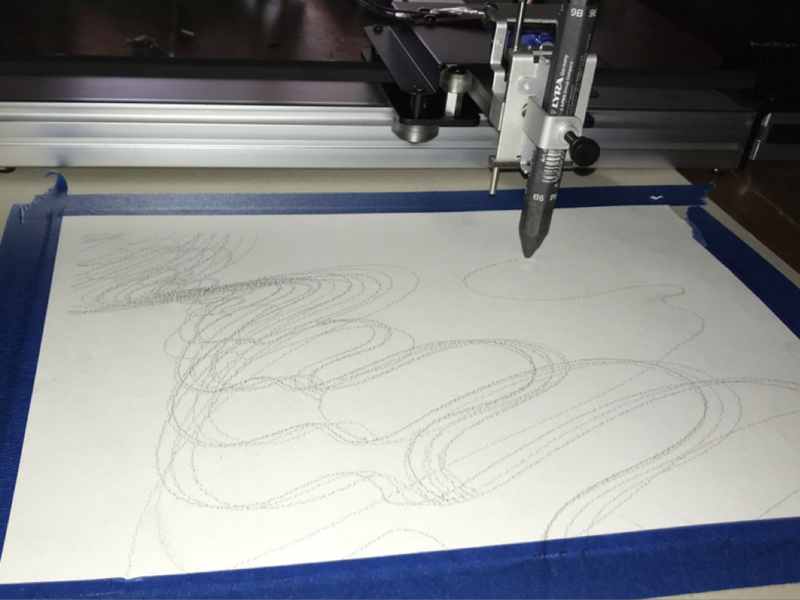 I experimented with different pencils and a 2-axis plotter to quickly generate physical drawings of the procedural forms I created in Processing. I love the plotter for its speed and ease of use, and also for the fact that you can use a wide range of different drawing media with it. It works well with pens, pencils, and even can be modified to support paint brushes- all tools that one can also use by hand. Using the plotter is also often a social activity. It’s highly visible without being disruptive or noisy, and people tend to come by and ask about it, or watch it while it works. I really like this quality. Once the drawings had been plotted, I used a variety of different pencils to manually finish them- adding in shading and different texture effects. While it would have been possible to add some of these effects with the plotter, the process of manually drawing on top of the plotted drawings gave them a different quality. Unlike coding and plotting, which requires a linear-planning intensive process, drawing by hand enables me to work intuitively and serendipitously. I can quickly try something out, and if I like it, continue in that direction. Each stroke informs the next. 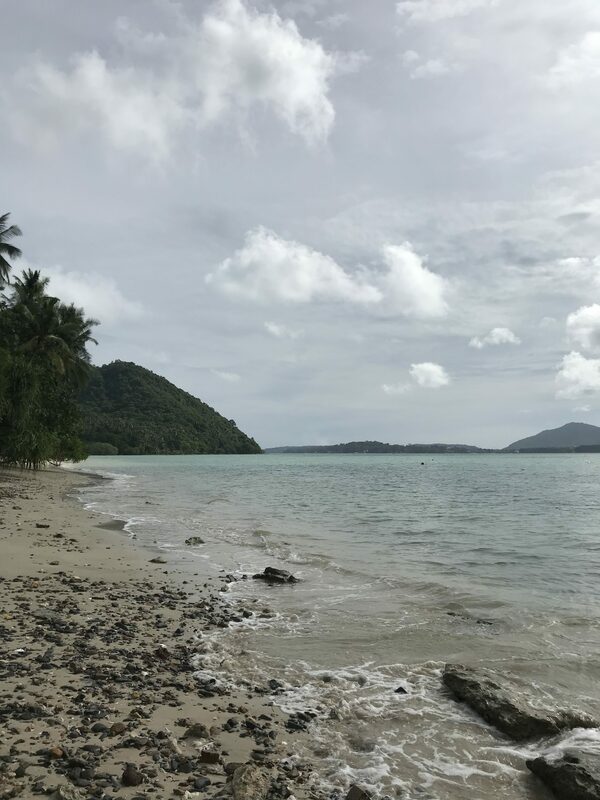 In addition, coding or the plotting required access to electricity, whereas manual drawing enabled me to work anywhere on the island. By the end of my stay, I completed 4 drawings. 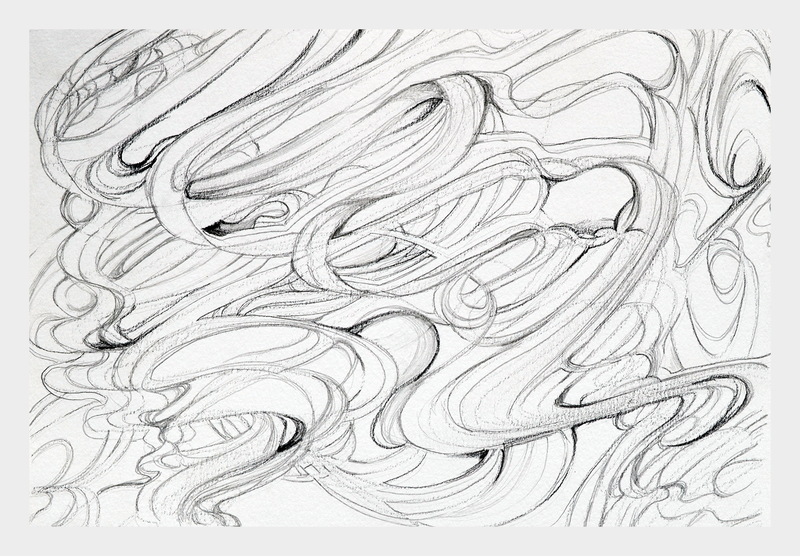 My first drawing was an abstract composition that was largely inspired by the waves and foam on the shore of the island. Since this was the first drawing of the series, it was the most experimental. 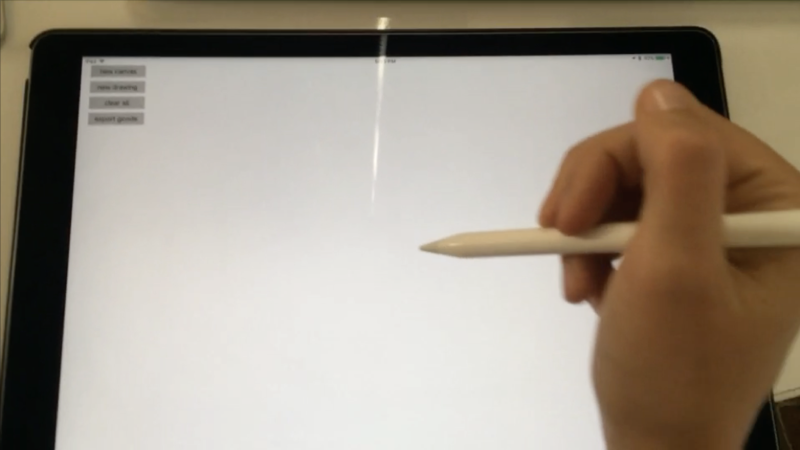 I started with a program that repeated and scaled a single stroke drawn with the tablet. 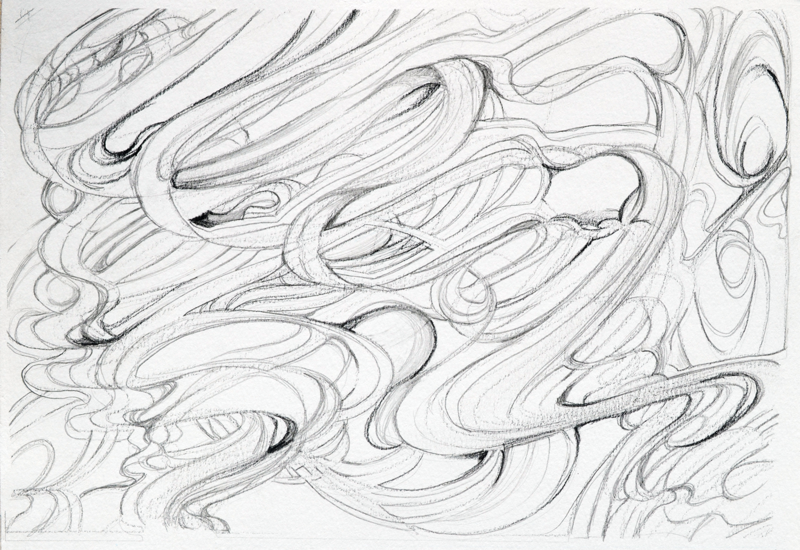 I drew with this program with wavy- undulating strokes, then plotted a series of these drawings with a rough charcoal stick. 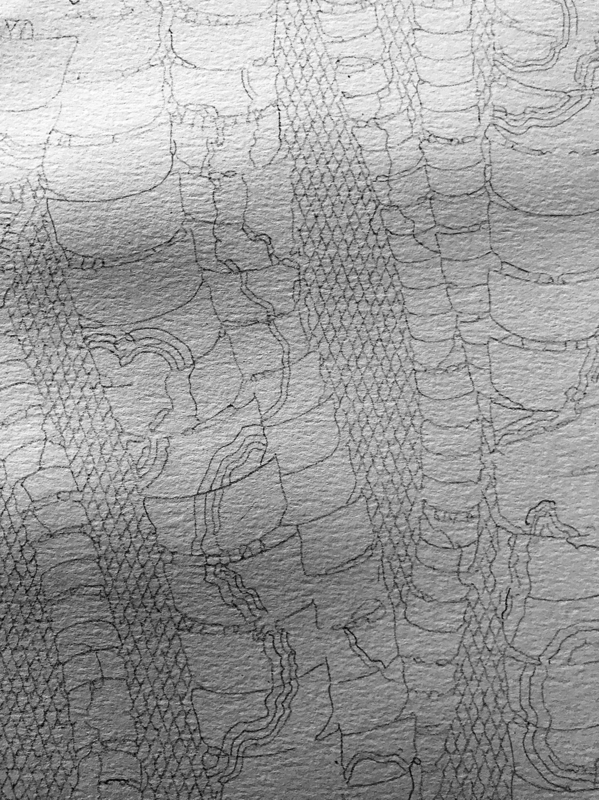 I spend some time with a 6B pencil darkening corners of the plotted drawing before placing the drawing under the plotter a second time and plotting a second series of lines (blue) upon the original. I then shaded and reinforced some lines manually, producing the finished result. Plants are often extremely algorithmic. 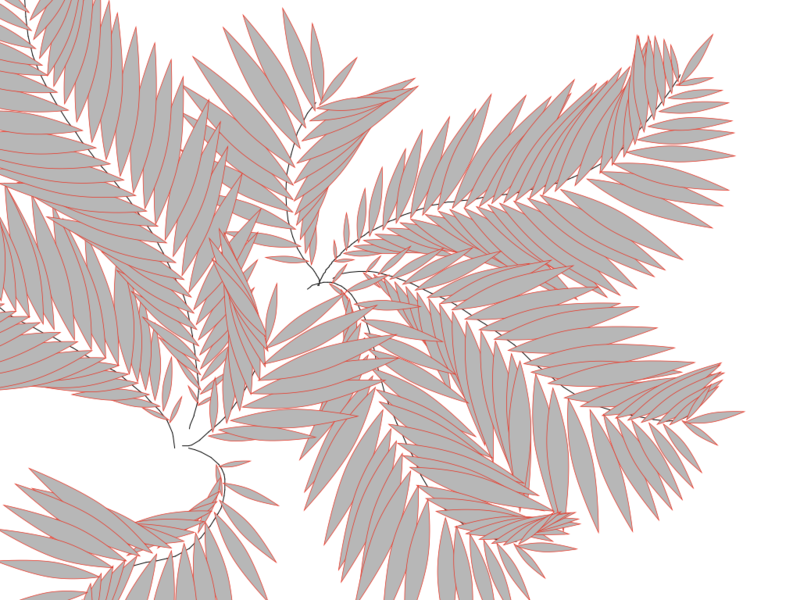 Inspired by the numerous ferns on the island, I wrote a program in Processing that repeated a simple leaf shape along a hand drawn line, and mirrored it on the reverse. I modified the program so that it scaled the leaf shape so that they grew larger towards the center of the line, and smaller towards the end. 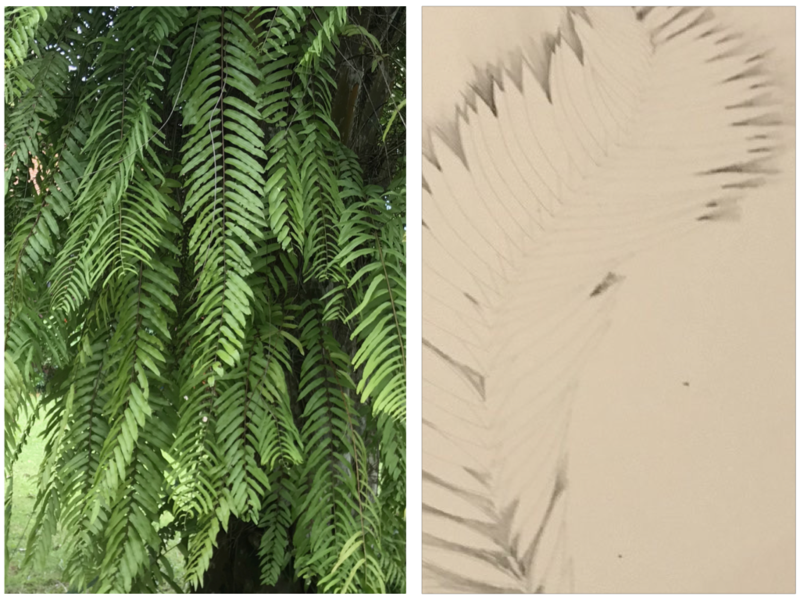 This way, I could quickly draw a variety of different fern fronds. 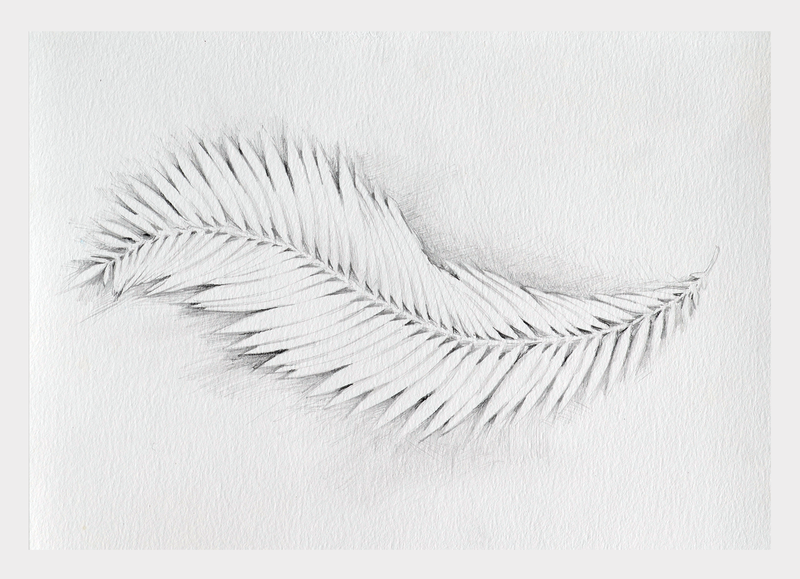 Rather than plot multiple ferns, I decided I liked the simplicity of a single frond. I plotted it with a light pencil and shaded the back of it by hand to create a contrast against the white paper. By the third drawing, I had started to get more ambitious. I loved the patterns the lichen made on the bark of the palm trees around the island. I wrote a program that repeated palm segments along a hand drawn path. I then wrote a second program that automatically generated lichen-like shapes by creating a irregular outline, and then repeating and scaling out that outline around the perimeter to create a set of rings. I used Perlin noise to create the variation in the ringed sections. The math to generate the lichen took a little while to figure out, and as a result, I spent longer coding this pattern than I would have liked. To take advantage of the plotter’s capabilities I added a complex hatched-background to the vector illustration. Below is the finished plotted result. 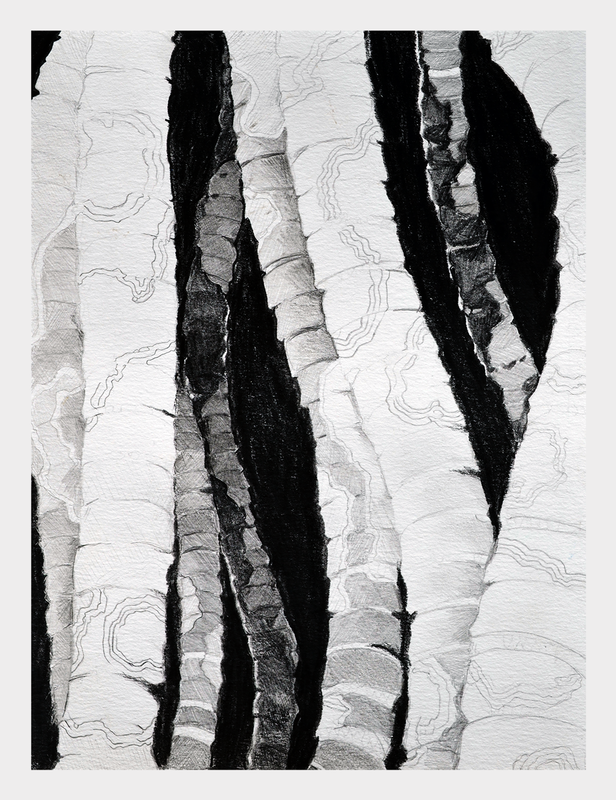 I wanted to use manual drawing to create sense of depth in the drawing by shading the smaller stalks a darker tone and keeping the larger stalks light. I liked this effect, but realized it didn’t work well with the complex hatched background, so I ended up removing it and shading it dark. Yet another great thing about working by hand after plotting- you can make changes at will, and in an improvisational fashion. By the final day, I had gotten slightly behind. The shading on the palm and lichen piece took longer than expected and I had to prepare a presentation for the evening. Therefore I decided to rely on a simple but effective technique for the last drawing: bilateral symmetry. I wrote a program that mirrored and repeated whatever I drew by hand on the horizontal axis. 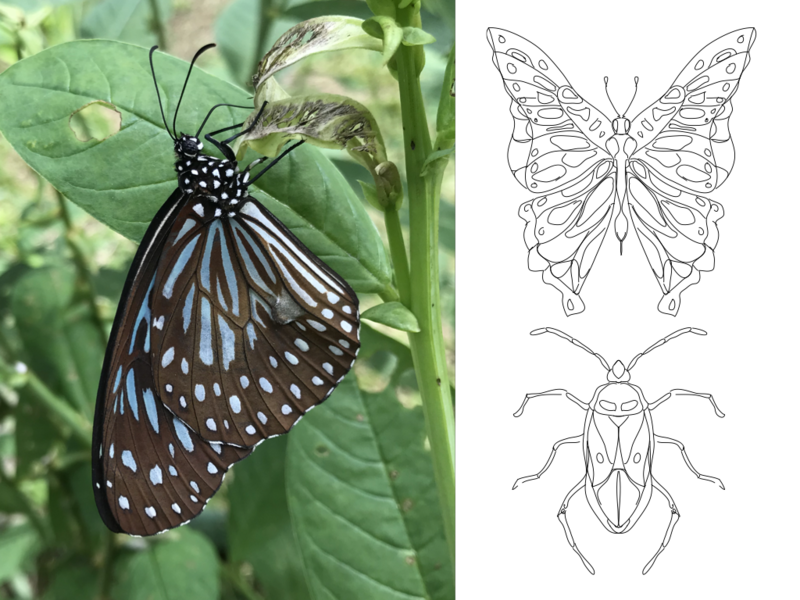 I then used this program to draw two insects- a butterfly and a beetle. 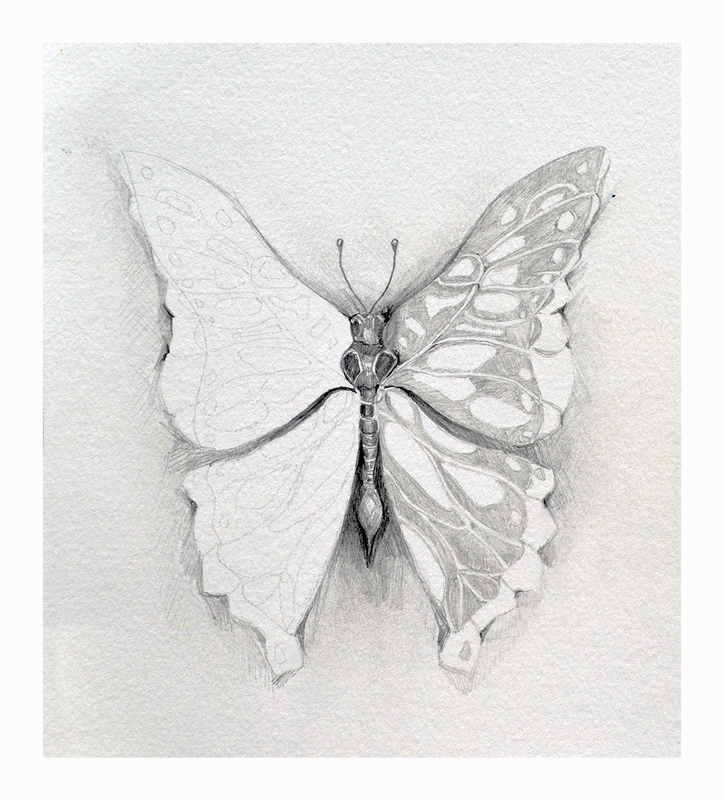 I ended up only having time to plot and shade the butterfly. I left one side of the butterfly plotted but unshaded. I liked this contrast. Sometimes simple is best. 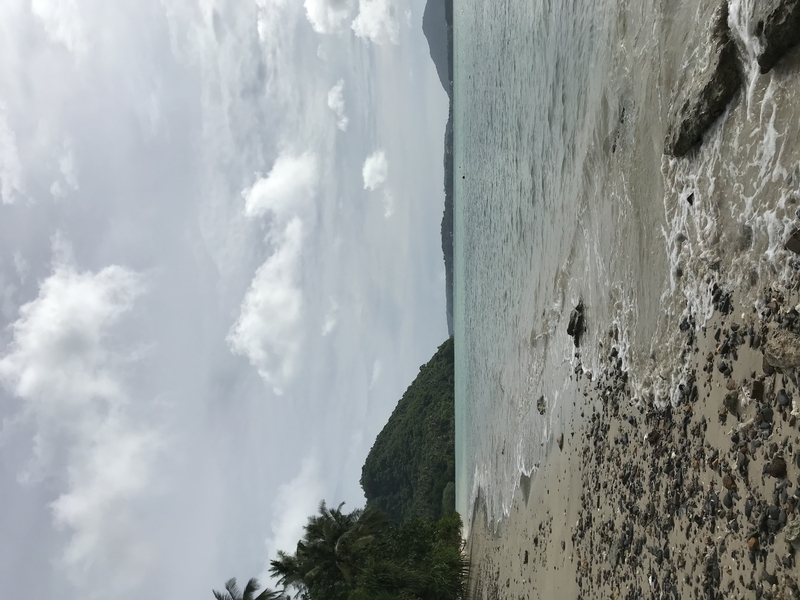 Next morning, I packed, had breakfast, and took the boat off the island. 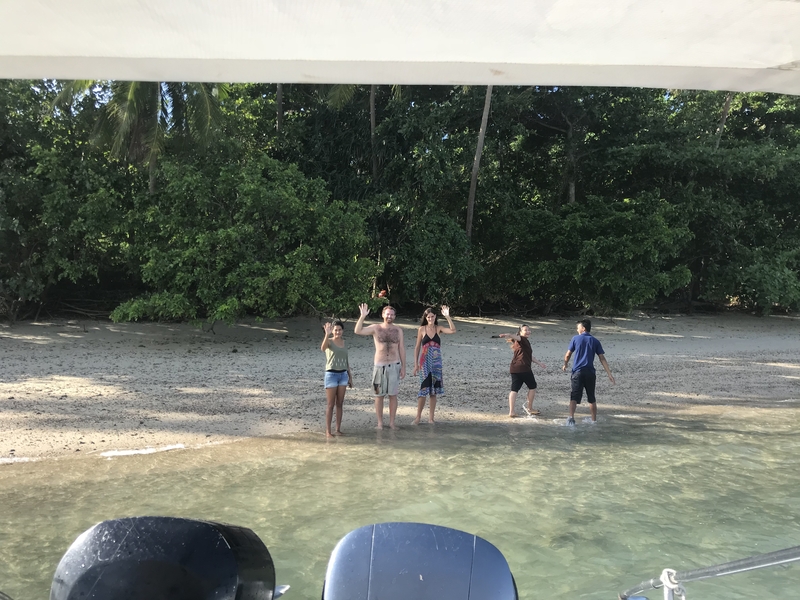 Dinacon was a wonderful, unique, experience, filled with lovely generous people. I can’t thank Andy and Tasneem enough for organizing it and letting me be a part of it.